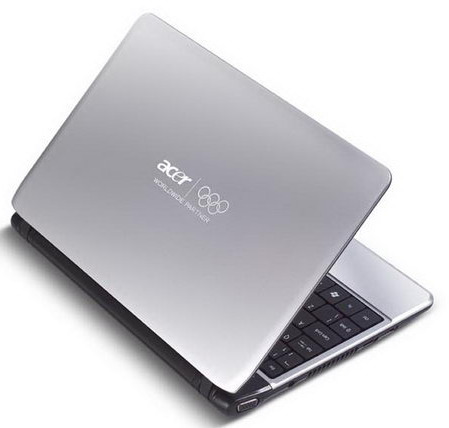 In order to celebrate the upcoming 2010 Vancouver Olympic Winter Games, Acer has announced the limited Edition of their CULV ultra-portable notebook – Aspire AS1410. The latest ultra-portable laptop is equipped with 11.6-inch LED-backlight display with 1366 x 768 pixels resolution and Intel GMA 4500MHD graphics card to control the graphic. In addition, the Aspire AS1410 comes with 1.2GHz Intel Dual Core Celeron SU2300 processor, up to 4GB of RAM and 250GB HDD. Furthermore, it integrated with WiFi a/g/n and gigabit Ethernet that enable fast access to the web and social networks. The laptop also comes with speakers and Dolby Sound Room audio technology that can enhancement to deliver lifelike sound for enjoying videos, movie and music. The new Acer Aspire AS1410 is the limited edition set which only 1,500 models available. The laptop weighs only 1.4 kg and will available starting on 27th November with price starting from $897.